Kiowa County lies in the southwestern portion of Oklahoma, surrounded by Washita County to the north, Caddo and Comanche counties to the east, Greer and Jackson counties to the west, and Tillman County to the south. The western and southern boundary, the North Fork of the Red River, separates Kiowa from Jackson, Greer, and Tillman. Among fifty-eight archaeological sites reflecting the presence of prehistoric Native peoples in the county, one, the Cooperton Mammoth Site, indicates Paleo-Indian presence. Archaic peoples are reflected in eighteen sites and Woodland occupation in one. Thirty-eight Plains Village sites have been examined. In the modern period Spain and France claimed ownership of the region. The area became part of the United States with the Louisiana Purchase in 1803. The Doak's Stand Treaty of 1820 gave all of southern Oklahoma to the Choctaw. The area's history is rich in cultural encounters. In 1833 the Osage attacked a Kiowa camp near present Cooperton. The Osage decapitated the victims and left their heads in copper cooking pots for the returning Kiowa warriors to find. The Kiowa have since referred to the area as Cutthroat Gap. This incident, coupled with Choctaw complaints against the hostile Plains Indians, factored in the formation of a dragoon unit under the command of Gen. Henry Leavenworth and Col. Henry Dodge. The 1834 Dodge-Leavenworth Expedition met the Kiowa and Comanche at a Wichita village in Devil's Canyon on the North Fork of the Red River. A peace treaty ensued. Located on Otter Creek near Mountain Park in 1858–59, Camp Radziminski operated as the northern extension of a line of forts across Texas to control and subdue the Plains Indians. By the end of the Red River War in 1875 the Kiowa, Comanche, and Plains Apache had been confined to a reservation that encompassed present Kiowa County. As promised in the Medicine Lodge Treaty of 1867, the government opened a boarding school six miles south of Gotebo at Rainy Mountain. The Rainy Mountain Boarding School existed from 1893 until 1920. The cattle industry of surrounding regions affected the area from the 1850s. From 1855 until the reservation era the southwestern portion of the Choctaws' domain, including Kiowa County, became the Leased District, a place where cattlemen grazed large herds. From 1876 until 1888 the Western Trail crossed western Kiowa County. Approximately 300,000 head of cattle were moved up the trail yearly from Texas to Kansas. In 1892 the Jerome Commission began enrolling the Kiowa, Comanche, and Apache in preparation for opening their reservation to white settlement. After several Oklahoma Territory land runs, Dennis Flynn, the Republican territorial representative in Congress, proposed a lottery as a more orderly and less dangerous way to open the reservation. Individuals registered for the lottery at either Lawton or El Reno. One hundred sixty-five thousand individuals registered for thirteen thousand available claims, each comprising 160 acres. The drawing began on August 6, 1901. Each townsite consisted of 320 acres. Lots were auctioned to raise funds for county government. Hobart, named for Vice President Garrett A. Hobart, was designated as the seat of Kiowa County. Transportation developments ended the cattle drives and brought rail access to the future Kiowa County area. In 1900 the Chicago, Rock Island and Pacific Railway built west from Anadarko across the northern part of the county, linking Hobart with Chickasha and Mangum. In 1902 the Blackwell, Enid and Southwestern Railroad (later part of the St. Louis and San Francisco system), completed its north-south line connecting Kansas to the Red River, passing through Hobart. Finally, in 1908 the Kansas City, Mexico and Orient Railway (later the Atchison, Topeka and Santa Fe system) completed its Kansas-Texas line from Clinton through Lone Wolf. These linked the county's economy with outside agricultural markets. Following 1907 statehood, residents in southern Kiowa County won the support of Gov. Charles N. Haskell, who in 1910 proclaimed Hunter Township, Mountain Park, and Snyder, all in Kiowa County, and portions of western Comanche County, to be "Swanson County." Trouble erupted immediately when Snyder disputed Mountain Park's designation as county seat. Following a homicide, a kidnapping, and charges of election fraud, Comanche County filed suit to dissolve its new neighbor. 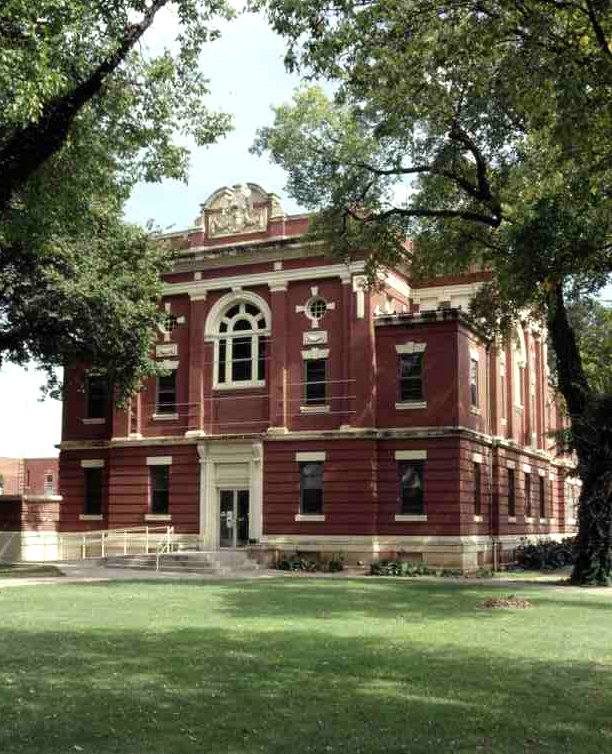 Swanson County ceased to exist in June 1911 when the Oklahoma Supreme Court upheld a lower court decision. Citizens of Hunter Township, which included the communities of Siboney and Manitou, voted to join Tillman County after the dissolution of Swanson. Although bounded on the south by the Wichita Mountains, Kiowa County is largely flatland. Principal crops are wheat, cotton, and other grains. Cattle, hogs, and sheep dominate the livestock arena. Vineyards were added to the agricultural base in the late twentieth century. Major water sources include the Washita River, Elk Creek, and Otter Creek. Lakes Altus-Lugert on the North Fork of the Red River and Tom Steed on Otter Creek provide both commercial water and recreational areas. The Burlington Northern Santa Fe Railway and Farmrail furnish transportation of agricultural goods. Hobart Municipal Airport provides air access. Major thoroughfares include State Highway 9 and U.S. Highway 183. The county has 1,030.66 square miles. By the year 2000 Kiowa County was home to several industries, such as Chicago Rawhide in Hobart, a manufacturer of rubber seals; the Dolese quarry near Roosevelt; Highland Supply in Hobart, manufacturer of Easter grass; and the Parsons Monument Company in Mountain Park. Education is offered from kindergarten through twelfth grade at Hobart, Lone Wolf, Mountain View–Gotebo, and Snyder public schools. The county enjoyed a steady population growth from 22,247 at statehood in 1907 to 29,630 in 1930. That number subsequently declined from 22,817 in 1940 to 12,532 in 1970. Census records for 2000 showed a population of 10,227. Of the 9,446 counted in the 2010 census, 80.4 percent were white (8.8 percent Hispanic), 46.6 percent American Indian, 4.2 percent African American, and 0.3 percent Asian. Hispanic ethnicity was identified at 8.8 percent. Incorporated towns included Cooperton, Gotebo, Hobart, Lone Wolf, Mountain Park, Mountain View, Roosevelt, and Snyder. Kiowa County was the birthplace of several well-known Oklahomans. Col. Jack Treadwell of Snyder, who served in the180th Infantry, Forty-fifth Infantry Division, during World War II, received the Congressional Medal of Honor. Gen. Lavern Weber and Dale Meinert, an All-Pro linebacker for the St. Louis Cardinals, were born at Lone Wolf. Novelist N. Scott Momaday (1934–), 1969 Pulitzer Prize winner for House Made of Dawn, is from Mountain View. National Register of Historic Places listings for Kiowa County include the county courthouse (NR 84003094), the downtown Hobart Historic District (NR 05000130), and other buildings in the county seat. Also listed is Camp Radziminski (NR 72001067), in the Mountain Park vicinity. A. Emma Estill, "The Great Lottery," The Chronicles of Oklahoma 9 (December 1931). "Kiowa County" and "Rainy Mountain Indian School," Vertical Files, Research Division, Oklahoma Historical Society, Oklahoma City. Pioneering in Kiowa County (Hobart, Okla.: Kiowa County Historical Society, 1975). George H. Shirk, "Peace On The Plains," The Chronicles of Oklahoma 28 (Spring 1950). Emily B. Smith, "Swanson County," The Chronicles of Oklahoma 9 (December 1931). Burna Cole, "Kiowa County," The Encyclopedia of Oklahoma History and Culture, https://www.okhistory.org/publications/enc/entry.php?entry=KI019.